This shield, with its feathered and gold design, was made by Aztec craftsmen early in the 16th century, probably not long before the Spanish conquest of Tenochtitlan in 1521. The excellent state of preservation suggests it was not used in actual warfare, but rather in a ritual ceremony or procession. The contrast between red and blue, along with the sparkle of the gold highlighting would have made a spectacular sight when held on display in a march of high-status warriors. This animal, with its spiky fur, seems to depict a mythical being: a feathered coyote. The tongue has been depicted as a flint-knife, the same tool used in pre-Hispanic ritual sacrifice. Spilling from the animal's mouth is the pre-Hispanic sign atl tlachinolli,the sign of sacred war among the Aztec. It suggests a battle cry. When the shield was displayed, the gold of the animal’s teeth, eyes, claws and coat of feathers would have made the figure seem to shimmer. It is not known who commissioned, or first owned this shield. The delicacy of the feather “painting” represents the handwork of highly skilled and practiced feather-workers. The richness of the materials and the warring iconography suggest that the intended owner was a person of high status who also served a military role in the Aztec empire. Carefully-worked materials, both luxurious and plain were combined to fashion this shield. Upon a woven support, were glued feathers of blue cotinga, scarlet macaw, yellow oriole, and quetzal. Fur rings the outer edge of the shield and feathered tassels hang from the lower portion. The blue-green coyote at the center, and the symbol for war spilling from his mouth are also lined with threads of gold. It measures 70 cm, or 27.5 inches in diameter. 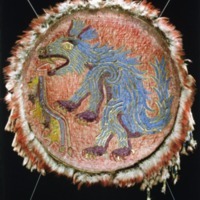 This feathered shield must have been collected from Mexico City or a site nearby and sent to Spain soon after the Spanish conquest of Tenochtitlan in 1521. By the late 16th century, the shield had become the property of Archduke Ferdinand II, whose collection included other pre-Hispanic feather-work pieces. The shield was transferred from his castle along with other imperial collections to Vienna’s national museums in the 1892, and today is housed in the Museum für Völkerkunde in Vienna. When pre-Hispanic featherworking entered European collections, it often became an emblem of “the exotic,” not specifically the Aztecs or even the Americas. Over the centuries, many of these objects were allowed to decay or were lost, suggesting their value as pre-Columbian treasures faded among collectors. 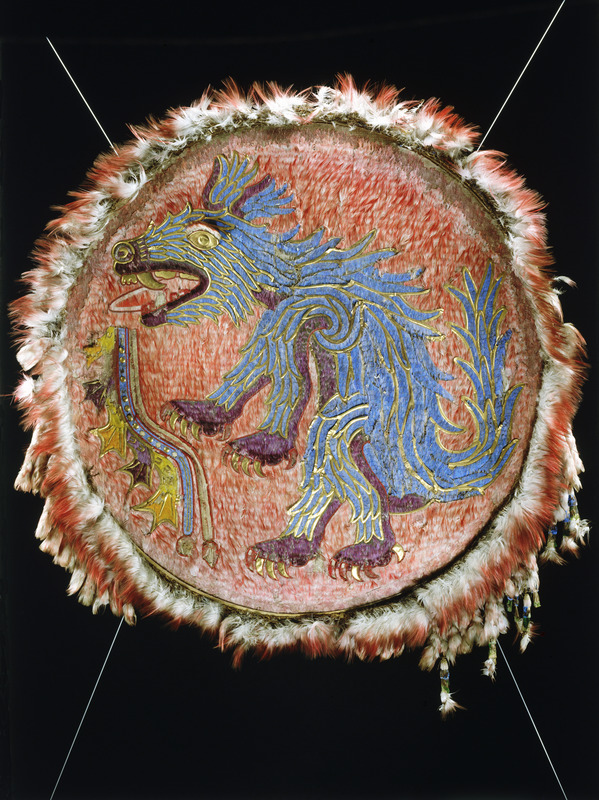 Today, because so little material exists from the time of the conquest, and especially so little perishable material such as featherwork, objects like this shield have become instrumental in reconstructions of pre-Hispanic visual culture.